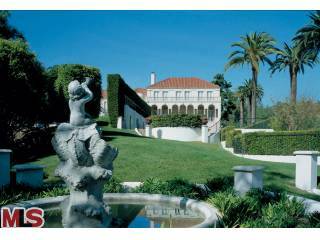 The home of Douglas Fairbanks and Mary Pickford in the 1920s. Decades ago, in the early 1900’s, a man by the name of Douglas Fairbanks (born Douglas Elton Thomas Ullman in 1883), rose to the height of fame in the very early years of Hollywood’s Golden Era. Fairbanks founded United Artists, The Motion Picture Academy, and even hosted the very first Oscar Ceremony held in 1929. He was well-known as a swashbuckling star of movies like Robin Hood, The Thief of Bagdad, Zorro and others. Eventually, Fairbanks married another Hollywood star, Mary Pickford. They became best known as Hollywood’s first “royal” couple, though neither one had one ounce of blue blood in them (not that it makes any difference). Both Fairbanks and Pickford were very well liked by the Hollywood crowd and the average person swooned whenever talk would center around either of them. For the times in which they lived, both were more than well-paid for their work as actors. In fact, Mary Pickford, Charlie Chaplin, and Douglas Fairbanks were the three highest paid actors among Hollywood’s elite. During the height of his fame, Fairbanks raked in thousands of dollars per week. His second wife, Mary Pickford alone, is said to have been worth $10 million then. Frankly, that is absolutely obscene and all based on acting. The Stock Market crash and Depression was not too far away and yet, during this time some actors were making $7,000 per week! How can that be justified? Prior to meeting Mary Pickford, Fairbanks had been married and then divorced. Though the match between Pickford and Fairbanks seemed to be made in heaven, they too eventually divorced after he began having an affair with another woman. In fact, Douglas Fairbanks had three wives with the first two ending in divorce. 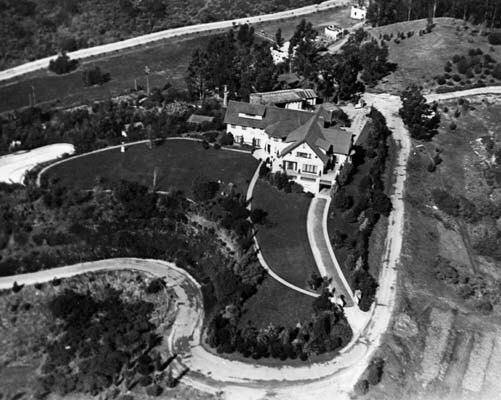 After the divorce became final, Mary Pickford got to keep “Pickfair,” the Hollywood Hills estate the two had purchased and renovated years before on 14-18 acres near Benedict Canyon. At the time of course, the house stood by itself. Today, while the home still exists, other homes have been built right up to the Pickfair estate. Today, Pickfair is still there (after several more renovations), and in 2008 was worth $60 million. Numerous people have lived in the home and it will likely go through several more sales before Jesus returns to this earth. It is ironic that these two people had everything they could possibly have wanted in this life. They had more money than could be spent in several lifetimes, had a beautiful estate and home overlooking Hollywood from the Hollywood Hills. They had servants, tons of friends, wonderful dinner parties (where everyone ordered from a menu), and were essentially above the control of studio executives since they started United Artists and other things, allowing them a certain amount of independence that other actors did not enjoy. Yet in spite of all this, what did they really have? Did they have salvation? Where are they now? The grave site of Douglas Fairbanks, Sr.
We know that in life as in death (or at least at the grave site), Douglas Fairbanks went to the extreme. 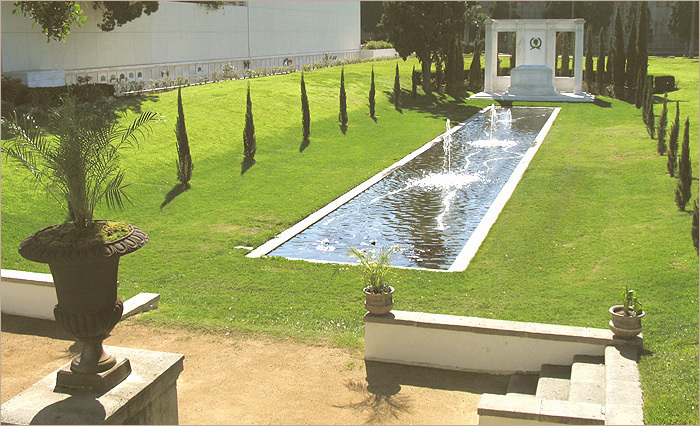 In the photo of his grave at Hollywood Forever Memorial Park (where he is also buried with his son Douglas Fairbanks, Jr.), we can see that a great deal of money was spent to ensure that the Fairbanks’ grave site would stand out. It was designed to let everyone know that someone of vast importance rested there. Who buys that much land to be laid to rest in, complete with a reflecting pond in front and trees lining the sides? Who does that? Certainly not someone who sees the utter temporal nature of this life itself. In the end though, Death caught up with Douglas Fairbanks, Sr., just as it will for all of us. Are you prepared? People who do what Fairbanks did with a grave site are literally building monuments to themselves. They wish to be remembered as someone who was very important and/or very wealthy. Even in death they are telling everyone else that they stand alone and apart from the common person in society. I’ve seen Fairbanks’ grave. The photo does not do it justice. However, this attitude that the very wealthy have toward the rest of us becomes null and void once they cross over from this life to the next. Need we be reminded of what the writers to the Hebrews tells us in Hebrews 10:31? That statement abounds in fear-inducing verbiage. A mere handful of words that should cause every living soul to stop, contemplate, and seek to correct aberrant behavior. For most, that aberrant behavior is in fully ignoring God Himself and the salvation that He alone offers! While Douglas Fairbanks Sr. lived, he lived a dream. He became exceedingly wealthy, while becoming one of the best-loved actors in the cinema of that day. Young men wanted to be him and lived their dreams through his adventures on the Silver Screen. On the outside, things couldn’t have been any better for Douglas Fairbanks, Sr. Yet, he was clearly not a man at peace with either himself or God because of his divorces. Once “talkies” made their way into Hollywood’s mainstream, that, along with declining health, forced him out of the game. By 1929, Fairbanks had made his last movie. By 1933, he and Mary Pickford had divorced. In 1939, Douglas Fairbanks Sr. was dead. No amount of fame or money could keep that from happening. God is fully in charge of that timeline for everyone. Throughout his entire life, like so many people in those days (and today), there was little to no thought of God. Some accounts indicate that Fairbanks was a Roman Catholic and while divorce is something the church frowns upon, remarriage (especially then) would have meant instant excommunication. This is not to say that Roman Catholics cannot be authentic Christians. I just think that with so many rituals incorporated within Catholicism, the average Catholic has a difficult time getting a good grasp on the God of the Bible. Nonetheless, the example of Douglas Fairbanks Sr., and Mary Pickford are proof that “things” or “circumstances” do not necessarily bring people closer to God, as they often should. Instead, people seek to resolve more clearly on their own devices, which often brings them further from God. I also want to be clear that I do not know (nor am I implying that I know) the state of the hearts of either Fairbanks or Pickford. I’m simply saying that in spite of all the “things” they had, they clearly had not found peace. What of death? Once Fairbanks died, did his extremely large grave site monument make any difference for him? Did it impress God? Like every other person, he literally “fell” into the hands of God Almighty. Was it a joyous occasion or one of abject terror? I believe Paul makes this very clear in Romans 1. In verses 18-23, Paul explains that the truth of God is naturally revealed in what is termed the General Revelation. We know God exists because of Creation alone. However, while that points out that fact, it does nothing to help us understand our need for a Savior in order that we might have salvation. Too many times, people live their lives in a state of total ignorance where God is concerned. They neither think of Him or live a life that glorifies Him. This is Paul’s point in Romans 1:24-25. 24 Therefore God gave them over in the desires of their hearts to impurity, to dishonor their bodies among themselves. 25 They exchanged the truth of God for a lie and worshiped and served the creation rather than the Creator, who is blessed forever! Amen. I wonder what Douglas Fairbanks’ answer would have been to the question, “What are you worshiping, Mr. Fairbanks?” In fact, it is a question that we all need to answer honestly. What are you worshiping? What am I worshiping? Matthew 6:24 cuts to the chase quite nicely and succinctly. I’m making real moves to better myself and chase my dreams…. I refuse to let anything or anyone mess that up…. This mentality is far too common with actors and acting. The power of “believing” is something they tend to live by because they believe that this “power,” once tapped is all they need to fulfill their goals and aspirations. I’m also amazed at how many actors say they are Christian and/or believe in God. Instead of finding out what God wants for their lives, they think it is up to them to determine and pursue their dreams. Much of this is based on their faulty understanding of the Parable of the Talents (Matthew 25:14-30). The saddest thing about being a Christian is realizing that we cannot force others to “see the Light,” to come to grips with their lost state and their need for a Savior. This is the heartbreaking issue with evangelism and it is one that Jesus (and His apostles) must have felt repeatedly. To know you have the truth and to see others shun it, mock it, and forcefully reject it is hard to deal with, but yet, this is the general attitude of the world. Jesus points this out very clearly in Matthew 7:13-14. We don’t know who will receive the truth and we don’t even know when. We may tell them and they may reject it repeatedly until one day they hear it again from someone else and their eyes open and they then embrace that truth. We will not know until we stand before God and hear the report of our lives. Whether we’re dealing with people from the early 1900’s or today, the problem is the same. People are on the path that leads to destruction. They are rejecting God and His solution to their problem. They need to be told there is another path that is far more narrow, but leads to eternal life. That path is not made up of a set of rules but is entered into through faith in Jesus and His finished work on our behalf. This is what makes it so narrow; faith and not works. Most people can appreciate having to work for something (though today even that morality is dying with more and more people simply wanting a hand out). What is most difficult for people is to believe in Someone outside of themselves in order to receive or gain something. Like our actor friend above, it’s relatively easy to depend upon yourself for success. But God says, “believe in Me and what My Son has already accomplished for you.” People don’t know what to do with that. Let’s be God’s mouthpieces. Let’s also allow God to live in and through us by maintaining fellowship with Him. That reality will back up our words so that the unsaved will see the truth in us and understand that what we preach is what we live. Entry filed under: christianity, Cultural Marxism, Emotional virtue, eternity, Religious - Christian - End Times, Religious - Christian - Prophecy, Religious - Christian - Theology, salvation, second coming. Tags: douglas fairbanks sr, Hollywood, hollywood forever, pickfair.